Swings Both Ways shot straight to the top spot, beating off Eminem's The Marshall Mathers LP 2 by 67,000 copies. The 39-year-old singer said although claiming the 1,000th number one was a "nice thing", reaching the chart summit was most important. "It's a nice bit of synchronicity, and nice that it hasn't gone unnoticed, but I don't know what it means, really," the Take That star said. "The story for me is that I'm number one, it's sold a load: ace. The fact it's the 1,000th number one is a nice thing but it'll be forgotten by everyone on Tuesday." Williams has sold 18.6 million albums in the UK across his solo career, and 55 million globally. Swings Both Ways - his second chart-topping swing album after Swing When Your Winning in 2001 - comes 57-and-a-half years after Frank Sinatra's Songs For Swingin' Lovers became the first ever UK number one. 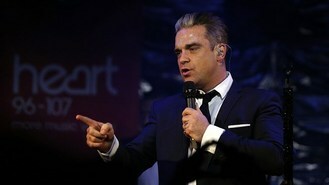 The Stoke-born star said: " Frank was the first number one, so it shows the enduring appeal of swing music. "I think in these days with people taking their clothes off and doing drugs and being cynical in whatever way possible to get attention - and good luck to them - I think there is a market for middle-of-the-road entertainment. It harks back to a simpler time." In third place in this week's album chart was Jake Bugg's Shangri La, a new entry, ahead of Celine Dion's Loved Me Back To Life which slipped from third to fourth. The compilation The Nation's Favourite Elvis Songs stayed in fifth position. In the singles chart Lily Allen surged ahead of midweek leaders Bastille and Gary Barlow to take the top spot in the closest chart battle of the year. Her cover of Keane's Somewhere Only We Know, which features on John Lewis's Christmas television advertisement, finished ahead of Bastille's Of The Night by just 660 copies. The song is Allen's third UK number one single following Smile in 2006 and The Fear in 2009. Barlow's Let Me Go went straight into the chart at number three, ahead of of Ellie Goulding's How Long Will I Love You in fourth and The Monster by Eminem and Rihanna in fifth.